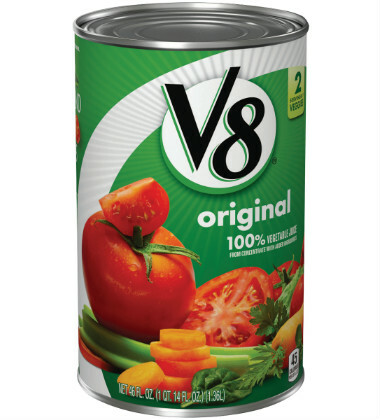 V8® 100% Vegetable Juice combines with onions, green peppers, garlic, peppers and hot sauce to make this perfect spicy rice side dish. onion, minced	 1 lb. 1 qt. 1. In large skillet with lid or rondo, heat oil over medium-high heat; add onions and sauté 6 minutes, stirring often. Add garlic and continue to sauté 2 minutes, stirring. 2. Add peppers and continue cooking 5 minutes, stirring often. long grain white rice, unprepared	 32 oz. 1 1/4 qt. black pepper, coarsely ground	 2 tsp. 3. Add rice and cook, stirring often, 5 minutes or until rice is coated and heated through. 4. Stir in Vegetable Juice, hot sauce, bay leaves and pepper and bring to a boil. Cover, reduce heat and simmer on very low for 18-20 minutes or until liquid is completely absorbed and rice is tender. Remove from heat and let stand 5-10 minutes before serving. 5. 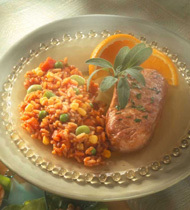 To Serve: Scoop 1 cup rice per serving and serve as an accompaniment for grilled meats, poultry, fish, seafood, etc. onion	 1.25 lb. 1 qt. long grain white rice	 32 oz. 1 1/4 qt.